For the upcoming conference we have three main objectives: Building a blockchain, AI, and data science hub by providing robust resources and connecting real-­world expertise. Fostering the AI, data engineering, and data science ecosystems and broaden the adoption of their underlying technologies, thus accelerating the innovations data can bring to society. Last but not least, empowering and nurturing community growth by offering online resources, conferences, the latest industry trends, and data related job opportunities. Our conference features three sections. 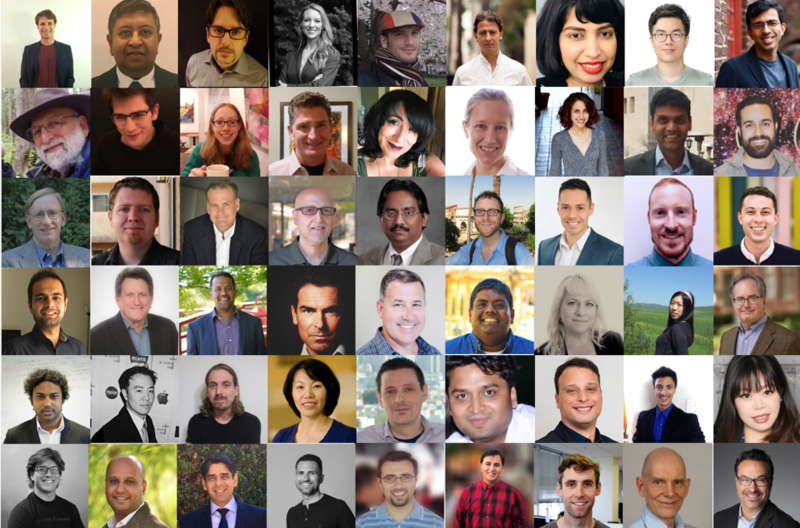 Speaker Sessions – A diverse selection of trending topics through multiple tracks including Artificial Intelligence, Data Science, Blockchain, FinTech, Healthcare, etc. Exhibition & Recruiting Event Sessions – Aims to build a platform for companies to interact with our audience. Saturday Night Afterparty (additional reception admission required) – Provide unique networking opportunity with speakers, industry leaders, innovative startup founders, representatives, and educators. What you should expect from our 2018 conference is more than 200 speakers and panelists, 3000 attendees and 40 media partners. 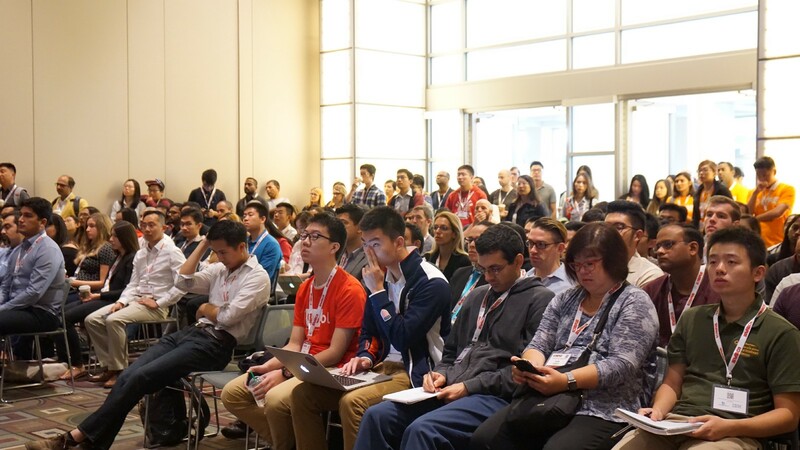 Speaker topic areas include Blockchain, Artificial Intelligence, Open-source software, Big Data, Machine Learning, Deep Learning, FinTech, Healthcare, and Predictive Analysis. Do you ever wonder who we are? 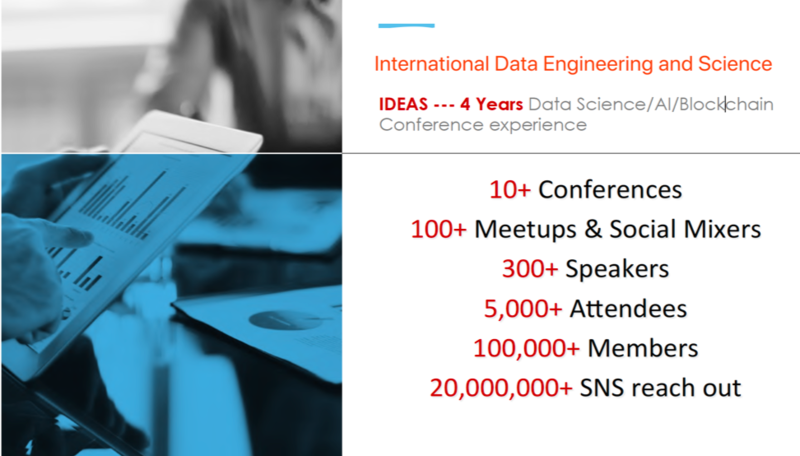 We are the International Data Engineering and Science Association (IDEAS). We have had 4 years Data Science/AI/Blockchain related conference experience. Hosted 10+ conferences, 100+ meet ups & social mixers, had 300+ speakers, 5,000+ attendees, 100,000+ members, and 20,000,000 + SNS reach out. Our conference would be beneficial for you in many aspects. If you are a student, our conference will provide you a mind-blowing opportunity to get in touch with industry professionals in many different fields. “Today, studies have shown that up to 80% of jobs are never advertised – they are filled by word of mouth.” Being able to network with industry professionals can really make a difference and open up doors for your future careers. If you are somebody from the industry, it’s an awesome opportunity to collaborate ideas, share thoughts, and learn from others. Our diverse trending topics regarding big data, blockchain, artificial intelligence, etc; will make sure that you are always at the top of the technology pyramid.